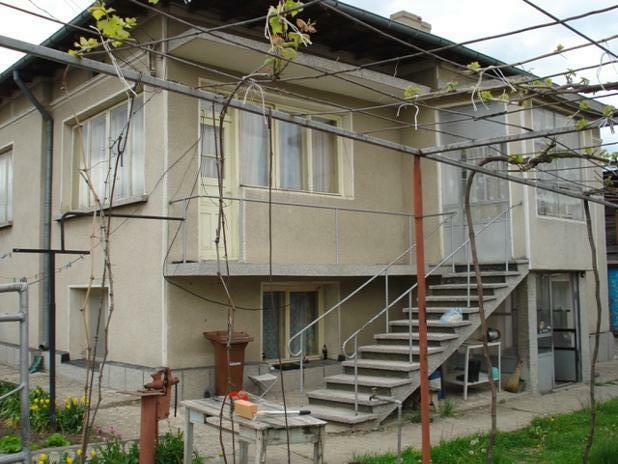 Description: Spacious house in typical Bulgarian style, in small town, situated 40km away from the Sea and from the Golf courses, Varna airport is 68km away. Located in a medium-sized town 22km from Dobrich. The solid built house is in the centre of the well sort after town of vo where you can find maintained system of medical services, banks, regular bus service, several shops, pub, post office, school, kindergarten and public utilities. It has good access, road network and the communications with all parts of the country. This area is connected with the Black Sea and Romania by roads in good condition, and the international highways to Poland, Ukraine and Russia. The house has a build area of 150sq. meters with a good size plot of 500sq. The house is 2-storay-one with two entrances, so is suitable for two families. Each floor has large salon, kitchen, a large bedroom, a large living room, bathroom and WC. All utilities: electricity, water, local sewerage. The property borders an asphalted road and is enclosed with a fence. Telephone line, Internet and cable TV are available. All essential services such as electricity and water supply are connected. Don`t miss this big house!